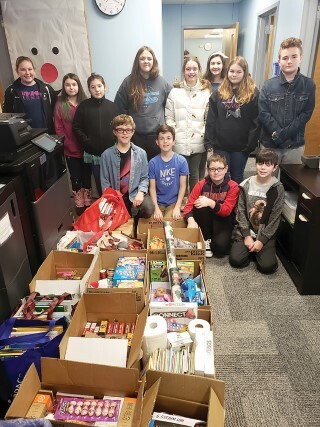 Windham Middle School Student Council conducted a Week of Giving in memory of our Health Teacher Mrs. Leroy who passed away on December 13th. They designated specific items for each day of the week (Canned goods, pet items, baby items, paper goods and a gift for a child) was collected from each grade to benefit the Windham Food Pantry. The students held a friendly competition and the winning homeroom from each grade won a cupcake party. The school made two deliveries to the Windham Food Pantry before Christmas and the last delivery went over today. The students collected 957 items for the Pantry! To the left is a photo of the last donation with the Student Council members and students from the winning classrooms.